Japanese Army. Via Ibiblio.org. Cropped by author. Hyakutake Haruyoshi (personal name also given as Harukichi or Seikichi) was born in Saga prefecture and graduated from the Military Academy in 1909 as an infantry officer. He was trained in cryptanalysis and graduated from the Army Staff College in 1921. He served in a number of staff and technical school positions in the 1930s, including command of 18 Division in 1940. 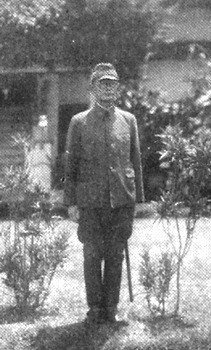 Hyakutake was serving as Inspector General of Signals Training when war broke out in the Pacific. He was assigned to command of 17 Army at Davao in May 1942, moved his headquarters to Rabaul on 22 July, and personally directed operations on Guadalcanal from October. Here he helped create the myth of the Japanese soldier as supreme jungle fighter, only to succumb to his own myth and demand more of his men than was humanly possible. As a result, they suffered cruelly attempting to survive and fight from the jungle depths. Hyakutake was trapped on Bougainville along with his army when the Allies established a heavily fortified perimeter at Cape Torokina. The attack by 17 Army on the Allied perimeter failed, and Hyakutake and his troops were reduced to a Stone Age existence in the jungle for the remainder of the war. Hyakutake himself suffered a debilitating stroke and was relieved in February 1945 by Kanda Masatane. However, there was no way to evacuate him back to Japan before the final surrender. Hyakuta was a short man, just over 5' tall, and was thin to the point of appearing almost frail. However, his mild manners concealed considerably tenacity and loyalty to the Emperor.